MONEY.CA online, Money Magazine presents The Financial Show, for Canadian Financial Literacy and for ‘You and Your Money.’ Money Canada Limited is proud to sponsor and produce this RRSP Season event in the downtown Toronto area. Investors, advisors, general public welcome. This is also a mainstream media event and newspaper, magazine and television crews welcome as MONEY Special Guests. The Financial Show is on February 25, 2015 – Save the Date. See the website for more details about top financial authors, key note speakers and vetted financial product manufacturers executives. The Advisor Channel and Financial Seminar and Symposium attendees welcome to this important and prestigious affair at the Hilton hotel and Ruth’s Chris Steakhouse. Attendees – speakers, sponsors and financial advertisers are encouraged to participate. You always said you would give back perhaps you will take away something even greater. Elite – Canadian Financial Literacy Awards and Sponsorship event. 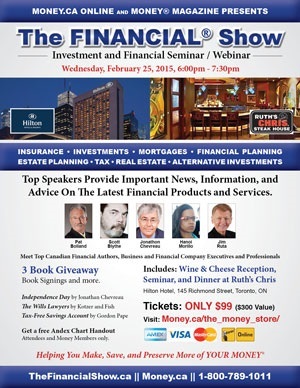 SOURCE: Money Canada LimitedMONEY.CA online, Money Magazine and Money Media presents The Financial Show, for Canadian Financial Literacy and for ‘You and Your Money.’ Money Canada Limited is proud to sponsor and produce this RRSP Season event in the downtown Toronto area.